Here's where you'll find what you'll need to know to be prepared for class each time we meet. This schedule is “tentative.” It always will be a bit fluid, depending on circumstances and by what's going on in the world. Click here to see the list of topics from a previous semester. Once we settle on your topics, I'll post them here for the world to see. I also have some good examples of finished research papers and compare and contrasts from a previous semester that I can make available. 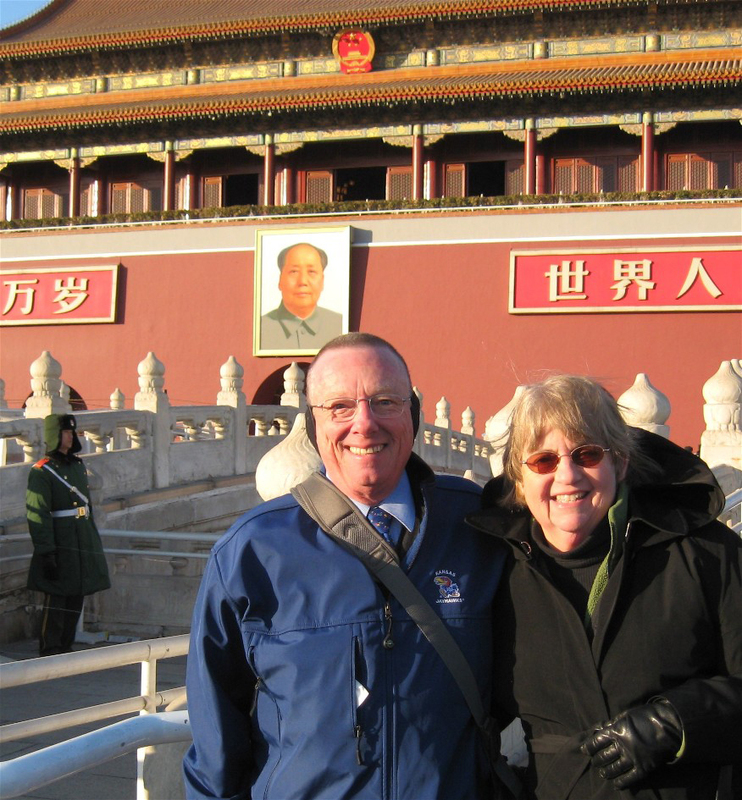 Malcolm and his wife, Joyce, at Forbidden City, Beijing, China, 2009. Click on photo to enlarge. Assignment due: Show me some proof that you have or have ordered the required text. Also, have some idea of a possible topic or, at least, topic area. Sign-up: Sign-up for a one-on-one meeting with Malcolm. Research orientation: We will gather inside the entrance of the Watson Library at 3 p.m. for an orientation session led by Julie Petr of KU Libraries who specializes in journalism research. She will let you know how to maximize your research and, as a result, your time doing research. Stay tuned. I'll alert you by email. This meeting (as all meetings) is required. Class session: “Control Room,” a documentary about CentCom, “the makeshift media village in Qatar where the United States military presented its version of events to assembled journalists from around the world” (N.Y. Times), with special emphasis on Al Jazeera. It, as the text, addresses issues central to this class. Discussion leaders: Teams #1 and #9. One-on-one meetings: We will have scheduled individual appointments to discuss your areas of interest and settle on your research topic. (The meetings will be in my office at 305 Stauffer-Flint. I will provide a sign-up sheet during the first class period.) Come prepared — have some definite ideas and some research to support them. You may select any area of the world and any issue, personality, event or entity affecting that area. Hint: Stay narrowly focused. Pick something that you genuinely interests you (and will hold your interest for the entire semester because you'll be spending a lot of time on it). Remember, it must have a strong media focus: How and why media play a role, how media are affected or influenced, or how media affect the audience. Oh, and have fun, too. Note: Those taking this class as NW (non-Western) must select a non-Western topic. Assignments due: Compare and Contrast #1. Also: Topic Report — (1) a thesis statement, (2) a half-page description of research topic, and (3) at least three references. (This will be type-written, single-spaced in 12 pt. Times or Times Roman.) AND, remember, you must begin it with a thesis statement. If you don't know what that is, ask.  Week 3: Sept. 11 — Al Jazeera and the World. Guest (via Skype): Josh Rushing, a former Marine Corps officer who was a central figure in “Control Room” and is now a well-respected correspondent and host of “Fault Lines” for Al Jazeera English, which will (will have) become Al Jazeera America on Aug. 20. Readings: Thomas L. Friedman column on Al Jazeera, column by Roger Cohen of the International Herald Tribune, The Violence Network (Boston Globe), and an article of your choosing (from your own research) about our guest, Josh Rushing (to which you will refer in your Compare and Contrast). Topic: Al Jazeera: A non-Western voice speaking to the world. Assignment due: Compare and Contrast #2. Guest (via Skype): Dima Khatib, a native of Palestine, is a South American correspondent for Al Jazeera based in Abu Dhabi and, frequently, Caracas, Venezuela, who played a significant role in covering, from her home base in Venezuela, the so called “Arab Spring” uprising in Cairo using Twitter. Readings: An article of your choosing on the “Arab Spring” uprising, recent events in the fallout following the “Arab Spring,” and/or the use of Twitter in such situations, whether in Egypt or elsewhere. Assignment due: Compare and Contrast #3.  Week 5: Sept. 25 — Women and Islam. Guest: Marwa Ghazali grew up in Lawrence, “the child of immigrant parents who came to this country with nothing but the hopes of achieving the good life in the late ‘70s.” Her father, an Egyptian engineer born and raised in the Sinai region of Egypt, attended KU as an MA student in engineering. He went on to complete a PhD in educational ethics at Kansas State. She says that her mother, also an engineer, sacrificed her own career to help support our growing family and to raise five children. Her mother frequently worked informally as a local caterer and was a regular vender at the Lawrence Farmer’s Market, selling Egyptian foods of all kinds to “curious” Lawrence residents. Marwa moved to Overland Park with her family at the age of 14 to attend a private Islamic School, where she was taught Arabic, the Quran, and Islamic studies through the 10th grade. She then transferred to Olathe East High School, where she became involved in debate, forensics and public speaking. She completed a BA in human biology at KU and her MA in anthropology. She is pursuing her PhD in medical anthropology at KU. At one point in her academic career, an independent research project sought to examine the complexities of the City of the Dead, Cairo’s impoverished populations who have come to reside in the graveyards and cemeteries. Her current project examines the process of how people may become so structurally invisible that they are referred to collectively as the “living dead” and how, over time, sacred spaces are slowly transformed into social spaces. Readings: “American Muslims: A Journalist's Guide to Understanding Islam and Muslims" by CAIR (Council on American-Islamic Relations). Assignment due: Compare and Contrast #4.  Week 6: Oct. 2 —Political Islam. Guest: Professor John Cary retired from the Army in 1998 after more than 25 years as a Middle East/North Africa foreign area officer, Army strategist, joint planner and Joint Staff officer. His principal assignments included service as an intelligence officer (Middle East, North Africa), team chief at the National Military Intelligence Center, director of Training for the Army FAO Program, as the U.S. Army Attache to Morocco, and as the chief of the Strategic Studies Division. At the Command and General Staff College at Ft. Leavenworth, Cary has written and taught advanced courses focusing on the Middle East, Iraq and Iran, and has been a guest speaker in advanced courses on Jihadism, Islam and Understanding Terrorism. He also teaches a number of core curriculum courses, including Civil-Military Relations and International Security Environment. He is a native Kansan, married, with two children, both of whom are University of Kansas graduates, His son, Jeff, is currently a Foreign Service Officer in Pakistan, and his daughter, Jenny, is the training coordinator for the residency program, Integris Medical Center, Enid, Okla.
Topic: Political Islam, including Muslim Brotherhood, sharia, and influences and reactions in the U.S. Readings: An email has been sent with the assigned readings. Assignment due: Compare and Contrast #5. Guest (via Skype): Arzu Geybulla (Geybullayeva), who visited KU in late fall 2011 (which is how I met her). She is a blogger based in Istanbul, Turkey, who comments on social and poltical issues affecting her home country of Azerbijan, a former part of the Soviet Union, and other issues relevant to the region, including Turkey. Azerbijan is a predominantly Muslim nation with close ties to the West that classifiies itself as a free and independent democratic society, a claim that she might clarify or dispute, depending on the topic. Topic: Blogging and social media journalism. Readings: An article of your choice that deals with blogging and how it (or the blogger) affects or is affected by society. In other words, some aspect of the implications, the benefits, the shortcomings, the dangers, etc. of bloggers and/or their blog. Also, check out her blog, “Flying Carpets and Broken Pipelines,” and her Web site to familiarize yourself to some of what she's doing. And, if you'd like, she has a Twitter account, too! Join the fun! Assignment due: Compare and Contrast #6.  Week 8: Oct. 16 — China: Friend or Foe, or Friend and Foe? Guest: Joseph G. D. “Geoff” Babb is a retired U.S. Army Special Forces lieutenant colonel serving as an supervisory assistance professor at the Army’s Command and General Staff College at Fort Leavenworth. 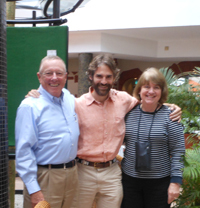 Babb holds an AB from Bowdoin College, an MPA from Clark University, and an M.A. and Ph.D. in East Asian Languages and Cultures from the University of Kansas. Babb was trained by the Army as a China foreign area officer and conducted his in-country training in Hong Kong and Beijing. He served in Washington, D.C., at the Defense Intelligence Agency and on the Joint Staff. He was the senior China analyst and deputy director of Current Intelligence at U.S. Pacific Command as well as an operations officer and northeast Asia desk officer at U.S. Army, Pacific. His last active military tour of duty was at Fort Leavenworth as the chief of the Strategic Studies Division of the Department of Joint and Multinational Operations. Babb has written articles on counterinsurgency operations, China security issues and Asia affairs, and was a contributing author for “The Savage Wars of Peace: Toward a New Paradigm in Peace Operations” and “Asian Security Handbook: Terrorism and the New Security Environment” published in 2005. Readings: Prof. Babb says, “Please find a magazine or newspaper article related to China's military, government, or economics situation to bring to class and prepare a question to ask.” That's it — except find two — one for paragraph #1 of your C&C and another for paragraph #2 of your C&C (and that way everyone will have two questions to ask. Hmmm, 38 students times 2 = 76 quetions! Yippee!!). Assignment due: Compare and Contrast #7. Take-home mid-term exam (CANCELLED): Questions — you will select one of three questions — will be sent by email immediately after class on Wednesday, Oct. 16. Deadline will be noon, Monday, Oct. 21, in my office, 305 Stauffer-Flint, or the desk in the Journalism Resource Center, where it will be time-stamped and put in my mailbox.  Week 9: Oct. 23 — Individual meetings. Assignment due: A one-page, single-spaced outline/description (in prose form) of your project with proper bibliography (on a second page). Simply: An expansion of your first Topic Report.  Week 10: Oct. 30 — Africa, Race and Stereotypes. “Guest”: Malcolm Gibson, who (as you might know because you should have, by now, read his bio) is a bit of an expert on the topic, particularly as it relates to stereotypes. Topic: “Africa The Dark Continent, yes or no?”and “Why is Barack Obama black?” Important note: This is a discussion that will confront all aspects of how we and the world view race. While sensitive, to say the least, we will be candid and direct, and we all will handle it with respect for the topic and people's views. I want a lively, and respectful, discussion. I will be confonting you with many “delicate” and controversial, yet vital, issues, likely posed as questions to challenge your critical-thinking skills. Readings: “Parlez-vous Lawrence,” a Lawrence Journal-World story from 1998 by a visiting French photographer; the story also appeared in the French version of National Geographic; “The Limits of the Parachute” (American Journalism Review); “Lives: In Harm's Way” (The New York Times), and “Dispatch: Ominous Signs, Then a Cruel Attack. Making Sense of Kenya's Westgate Mall Attack,” by Jeffrey Gettleman (The New York Times). Assignment due: Compare and Contrast #8.  Week 11: Nov. 6 — Brazil. Guest (via Skype): Bradley Brooks is chief of bureau, Brazil, for the Associated Press. An alumnus of the school, “Brooks joined the AP in 1998 in Kansas City, then moved to New York the following year as an editor in its Multimedia department. He left the cooperative in 2001 to move to South America, where he served as editor-in-chief of the Santiago Times in Chile and opened a South America bureau for United Press International from a base in Rio. He returned in 2005 as an editor in New York, working on desks handling both U.S. and international news, and did a six-month reporting stint in Iraq before returning to Brazil as Rio correspondent in 2008. Brooks is based in Sao Paulo, leading AP staff there as well as in Rio de Janeiro and Brasilia. He holds a bachelor's degree in journalism from the University of Kansas and a master's degree in International Affairs from Columbia University in New York” (The Associated Press). Topic: Brazil and Being a Journalist Abroad. Assignment due: Compare and Contrast #9.  Week 12: Nov. 13 — Presentations. Presenters and discussion leaders: Teams #1, #2 and #3. Note: Discussion leaders are your fellow teammates. Assignment due: Compare and Contrast #10. Note: You need to select TWO readings for your compare and contrast from the available readings provided by the presenting teams. If you're REALLY nice, read 'em all!  Week 13: Nov. 20 — Presentations. Presenters and discussion leaders: Teams #3 continued, #4 and #5. Note: Discussion leaders are your fellow teammates. Readings: Team #3's readings above. Assignment due: Compare and Contrast #11. Note: You need to select TWO readings for your compare and contrast from the available readings provided by the presenting teams. If you're REALLY nice, read 'em all!  Week 15: Nov. 27 — No class — Thanksgiving Break. No class session because of T'Day break. Have fun.  Week 16: Dec. 4 — Presentations. Presenters and (discussion leaders): Teams #5 continued, #6 and #7. Note: Discussion leaders are your fellow teammates. Readings: Team #5's readings above. Assignment due: Compare and Contrast #12. Note: You need to select TWO readings for your compare and contrast from the available readings provided by the presenting teams. If you're REALLY nice, read 'em all!  Week 17: Dec. 11— Presentations and wrap-up. Presenters and (discussion leaders): Teams #7 continued, #8 and #9. Note: Discussion leaders are your fellow teammates. Readings: Team #7's readings above. Team #8: Lauren Bolamperti: “Consumer Behavior in Asia”;	Ryan Eby: “How the NFL Intends to Push 'Olive Ball' in China”;	Courtney Lichtenberger: “Kony 2012 Through a Prism of Video Advocacy Practices and Trends”;	Megan Pense: Russian LGBT activists in U.S. to lobby against anti-gay law. Assignment due: No compare and contrast due this week; however, out of respect to your fellow presenters, please select at least two readings from the teams presenting. If you're REALLY nice, read 'em all!  Exam Week: There is no final exam. Deadline: Final research paper (in your pocket folder) is due by 5 p.m., Thursday, Dec. 12 noon, Monday, Dec. 16. Extra-credit: For those turning in your final paper — by noon, Tuesday, Nov. 26 — you will receieve a 5% bump in your grade (for any grade of 75 or more). Just turn in the paper, stapled in the top-left corner. Note: You will turn in your folder with all your work at the regular deadline on Dec. 12.